Liquid castile soap is highly concentrated, meaning a little goes a long way. To use castile soap as hand soap, you don’t even have to apply it full strength. Instead, I fill an old soap dispenser about 3/4 full with water and then top it off the rest of the way with castile soap. It looks really thin and liquidy in the bottle, but it still lathers in my hands just fine. And because each refill requires so little of it, I’ve been using the same two bottles of castile soap since I wrote that post in 2010, and I’ve still got a bit of time before I need to buy some more. I love my castile soap hand-washing concoction for all the reasons I already mentioned, but if I’m being totally honest, what really keeps me going this economical and eco-friendly route is the scent. I have both the lavender and peppermint varieties of Dr. Bronner’s liquid castile soap, and I used to switch off and alternate, reaching for the lavender one time and peppermint the next. And then finally, something brilliant and obvious occurred to me: I could mix them! My hand soap could smell like my favorite dish soap (Seventh Generation Lavender Floral & Mint)! So I did, and it does. I can’t believe I didn’t think of that sooner. So. Make your own hand soap, using other soap. It’s a simple idea but a super frugal and effective one. If you haven’t already, I recommend you give it a try! I have my diluted Dr. Bronner’s in a repurposed Dial Foam soap pump. The castile foams up awesomely, and then you don’t have to lather it in your hands. I keep my foam pump dispenser by my bathroom sink because I wash my face with castile soap too. Castile soap is amazing stuff! I use it for so much stuff around the house. 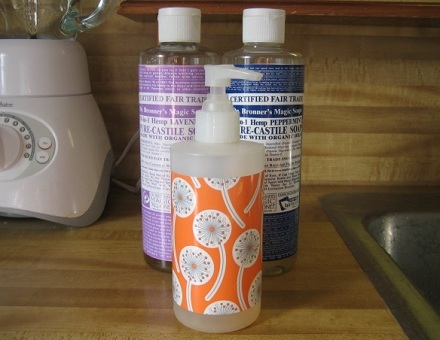 I use your same 3 parts water/1 part castile soap concoction for dish soap. I’ve just started using it withOUT diluting and it keeps clogging the pump. Diluting should really help. Thanks for the tips.